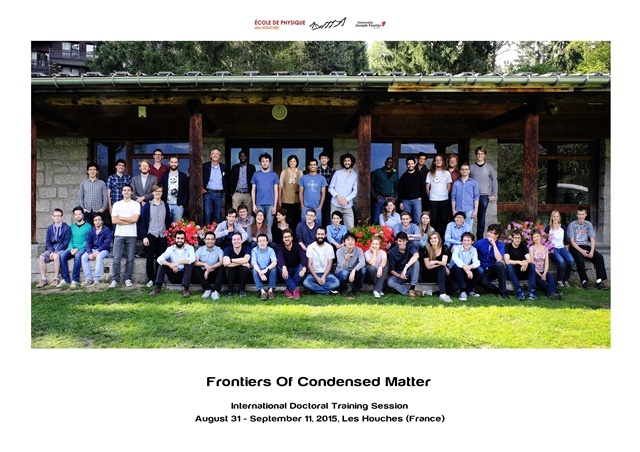 In the first two weeks of September, our Casimir pre-PhD students and some of our PhD students participated in the Summer School in Les Houches (France), called: 'Frontiers of condensed matter'. "You know that the Netherlands is really flat? Well, les Houches made the point that most of the world isn’t rather clearly. In fact, it does so quite bluntly, with a huge, erect, Mont Blanc - in your face. Let’s just look at a day in l’Ecole de Physique, shall we? Every morning, my alarm would ring around 7.15 - enough time to have a shower, shave and try to become generally presentable. I’m never sure if I succeed. This in- volves walking from the bed into a rather neat bathroom, with a shower, a sink and what not. The accommodation is very luxorious. Around 7.35 I’d leave the accommodation, stepping into the brisk mountain air. This is simply exhilirating - it’s fresh, it’s cold and oh-my-god there’s a 4809m mountain in my face. I’d walk down towards the restaurant, which is located at approximately the same distance horizontally as it is vertically. In there, there’d be croissants, coffee, coffee and more croissants. Around 8.30 it would be time to walk up to the lecture hall. After some general loitering in front of it, the lecture would commence. Now, in the morning we had interesting lectures - on topics like topological insulators or the spin diffusion equation with Rhasba spin orbit coupling. There would be three breaks, of which the second one separates two different lecture topics and includes cookies. Yes, you heard me - cookies. After the lectures, it’d be time for lunch, or dinner. I got confused, because apparently a three course lunch is normal in France. This lunch would be extremely good and we were served by some very hospitable, friendly french folk. One of these spoke English, the other limited English. Who said the French won’t? At this point, there would be a break of undetermined length. The idea was to have a one hour break, then have two seminars, but it happened that no seminar was scheduled - leaving time for hiking, if you so choose. Or, as I did one day with a new Finnish friend, draw the mountains on paper using pencils. That was fun. At some point, we also spent time making photographs. Les Houches features some cute, miniature lizards that show up if the sun shines. And, a creature I had heard of but not seen before appeared; the Hummingbird Hawk Moth. It’s a prime example of convergent evolution. It turns out it is at least a summer visitor in most of ‘Northern Old World’, and actually native to most of that area (among which, les Houches). Anyway, the seminars would be interesting. I think the most impressive one was by Lego Man, Vincenzo Vitelli from Leiden. He literally had a room full of physicists occupied with his Lego topological meta-materials for two hours. As the seminars concluded, we’d go down to the restaurant for dinner - again, three courses. Again, this would be plenty, luxurious. Had I noticed they took good care of our "culinary disabled"? They made a very good attempt at remembering what people had what allergy/diet, and try to bring them what they required. The evening’s be free, unless there was a poster session. The poster sessions were a chance to socialise. People are expected to bring a poster, so that conversations about research can be started. For instance, I made a polish friend after asking after its poster - by now, I’ve read its master thesis that it was turning in that week. It was really interesting. As one of the Casimir Pre-PhD students, I didn’t have much of a poster (lacking a Master thesis), but some people were still interested and asked after it. Of course, I’d ask them about their research immediately after, so I think the poster session was a success. One night, there was even a movie night which I think was organised by an English PhD. I forgot what movie we watched, but it was a SciFi movie and it was amusing. Afterwards, I spent some more time talking to the Polish friend. That’s, pretty much, a day in les Houches. In the weekend, most people would hike. You have to remember that even going to the supermarket takes about 2 hours."